Choose from thousands of top-rated private Arabic tutors in Ealing. Whether you’re looking for primary, 11+, GCSE, A Level or undergraduate tuition, find your perfect private tutor and book your lesson today. Arabic teacher with long experience in teaching all levels. I can teach Speaking, Reading and Writing. 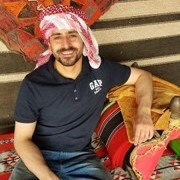 I come frome Jordan so I teach the Arabic dialect which is understood by all Arabs.